Best Bike Split Software is an online subscription service that allows you to model biking performance and it creates projections of your estimated & optimized biking time over a defined route of your choice. 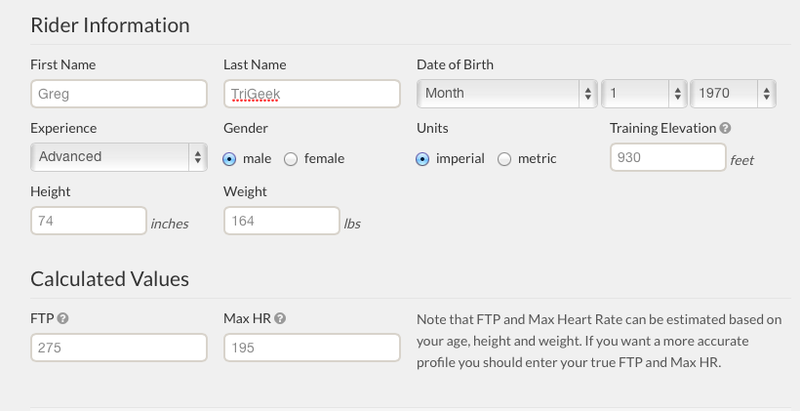 For example, if you are looking at IM CDA next year, you can input a series of basic information about yourself, and it will estimate your time to complete the bike course based on your FTP (Functional Threshold Power) and even calculate your TSS (Training Stress Score) as well. Really with just a little bit of background, anyone who trains with and/or understands the very basics of bike power can use this tool… it’s not just for Geeks. It would also be a fantastic tool for Coaches to provide as a value added service for their clients to help with racing targets. It can be used for basic race pacing (time as well as stressors via IF / TSS values), “what if” scenarios (how much time will aero wheels make) or course comparisons (what would my time be on CDA vs AZ). I have examples of these in the following paragraphs. Free to try. Premium single membership is $20/month or $120 per year. A Coaching version is available for $60/month or $600 per year for up to 20 clients. 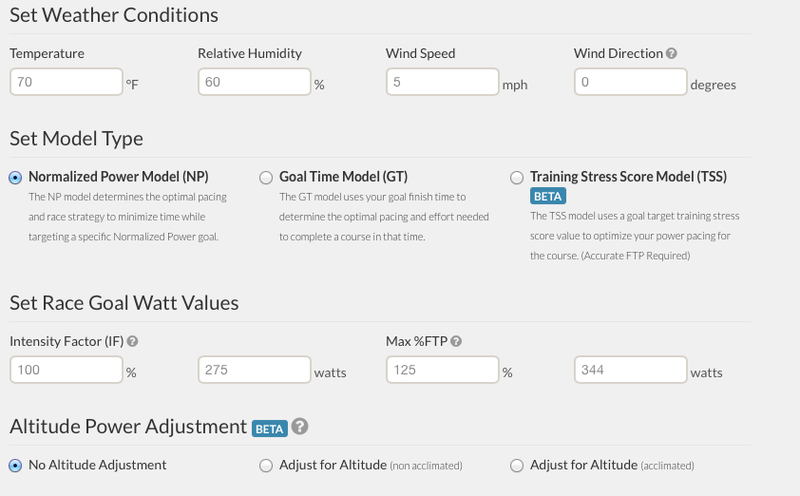 Cool tool, worth the entry fee for anyone doing an IM (and trains with power) to optimize their time (particularly since you can sign up for a couple months to establish your plan), should be a value added tool for coaches, and fantastic for geeky people like me. I’ve always been interested in bike aerodynamics and bike modeling. As seen in some of my RANT blogs, I’ve played with various online power / speed estimating tools, as well as creating some tools of my own along the way. I’ve used some of these tools to create projections of times on long course races, for myself and some of my friends, which can help determine pacing and racing strategy. Frankly, I feel bike pacing is probably one of the most important factors in an Ironman race strategy. Basic information about you. Key here is your Functional Threshold Power, FTP value. Below is how you define bikes. With a premium membership, you can add several bikes. This allows you to also model the same bike multiple ways. For example, I have my Cervelo P3 in a long course version (more weight for fluids, spares, etc. and no disk cover) and in short course version. 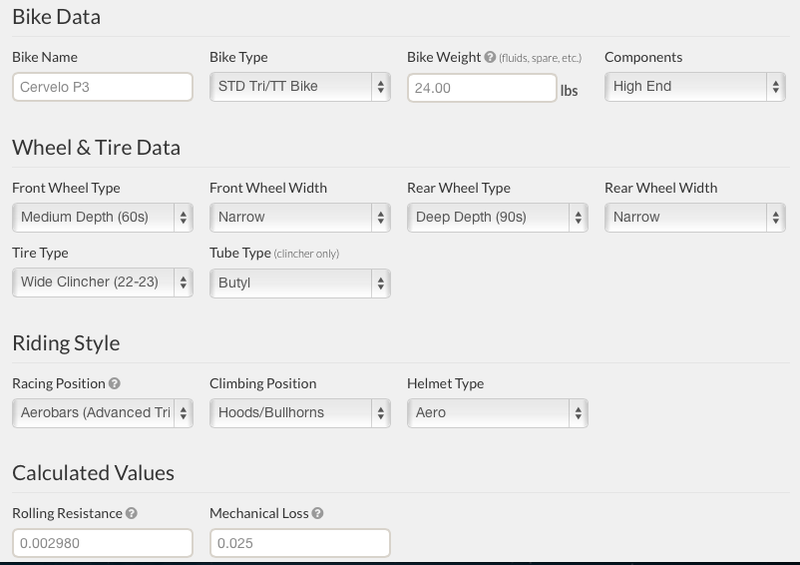 You can also create varying versions for testing “what if” scenarios, such as the same bike with or without aero wheels, different wheel depths, or even different tire widths. The data is general in nature (i.e. you can’t choose Zipp Wheels versus HED wheels), but gives you enough variables to make meaningful comparisons between configurations. Fairly straight forward setup for each bike. A good balance of basic options without making the input overwhelming. Simply choose an existing course. Note that there are options of selecting “verified” courses to ensure accurate data. A lot of the larger WTC events are already included in the database. The other option is to simply upload your own courses. This can be done by converting your existing ride data to a GPX format. If you have a Garmin, it’s as simple as exporting your existing ride data in Garmin Connect to a GPX file rather than TCX. 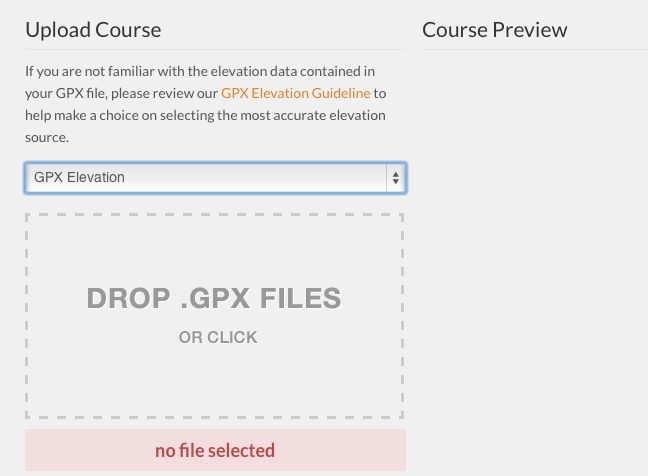 Easy uploading of courses… simply use GPX files. To ensure more accuracy in the data, it is better to use data sources that come from barometric altimeters rather than just GPS data, such as Garmin 500, 510, 800, 810, etc. For rides or races that are not in the database and I have not ridden personally, I will do a search in Garmin Connect of all activities, and find races done by other riders. Again, I look at the data sources on the activity and only select those recorded from barometric data sources. Keep in mind that the courses are created by other users, so I’d recommend confirming that the total elevation gains are similar to published data or to other sources such as MapMyRide. 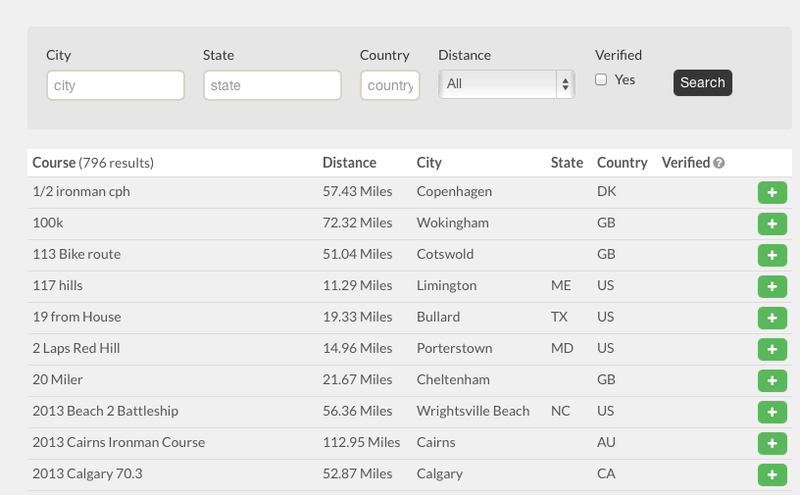 Note that BestBikeSplits will also verify courses, and the courses marked verified can be considered accurate. 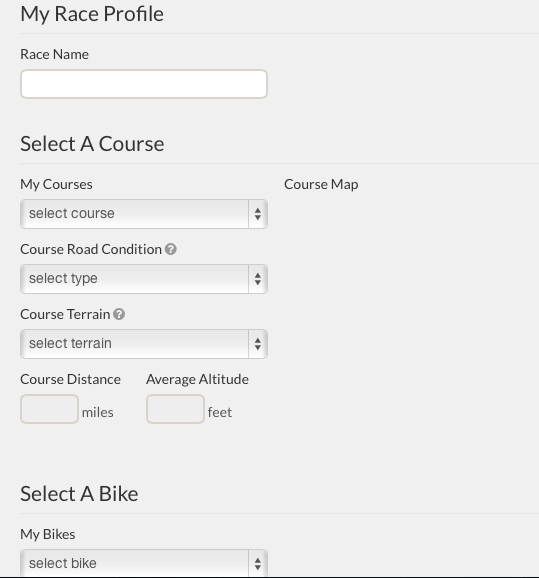 Entering your race data by naming the simulation, choosing a course, selecting road conditions, terrain and one of the bikes you created earlier. Normalized Power – You select your target NP value, and it calculates and optimized NP/AP value close to your parameter, and project how long the ride will take. Goal Time – You could enter your goal ride time and it will show you how much power (NP & AP) it will take you to accomplish your goal. Training Stress Score – You can input your target TSS value, and it will calculate both your time and the associated NP/AP values to achieve your TSS goal. For a great discussion on using TSS values for IM length races, see this article by Joe Friel here. For a more detailed view, here are public links of this example. CompuTrainer and TrainerRoad files that create courses/workouts to mirror the race, for training purposes. A Garmin power course. Best Bike Split essentially breaks the bike course into segments, which is also displayed on the bottom of the output page. Rather than trying to memorize the details of the plan, you can download the course to your Garmin biking device and it will pop up and tell you your targeted watts at the appropriate time during the ride. This is a neat concept, sort of real-time coaching service (see this link for additional details). The obvious use is for targeting and optimizing upcoming races. One race I’m considering in 2015 or 2016 is the Ax Tri in Norway. It has over 9000′ of climb so it’s not an easy course to simply “guestimate”. Although it’s only 56 miles (or so) in length, the duration is closer to a full IM bike ride for most people. With a simple download of activities from the prior year’s race, I was able to create a course. I then modeled the race based on my road bike, and the weather from the previous year. The last step is varying the target NP values and to see how it impacts the total time and TSS value, to create a race plan. The output for this example is here. Another benefit is “what if” scenarios. For example, I was asked by an acquaintance on what the “cost” of using a full water bottle versus empty water bottle on their bike at IM Canada. It was a simple matter of configuring a bike, to his bike weight, running the model and then re-running it with an additional 1.25 lbs on the bike. The impact was 42 seconds. I also ran a scenario based on a past question I had about IM AZ… how much impact would a set of carbon rims have versus standard rims? My “gut” feel originally was it would be less than 10 minutes. Running the model with deep rims over standard projected an improvement in total race time by 5:03, at projected paces, and this literally took less than 2 minutes to configure and run. 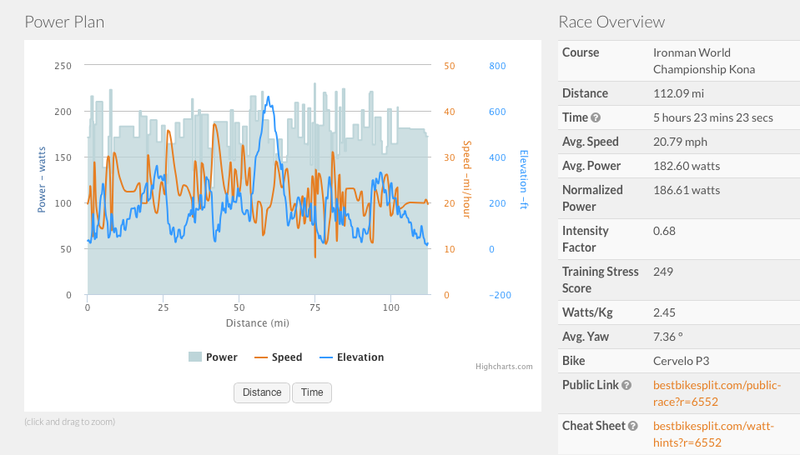 A third potential usage is to compare courses at similar power output. Ever wonder how your power output in an existing race would compare to another course? Now you can run the simulation. For example, looking at the old IM CDA course versus the new CDA course at 185 watts resulted in a 30 minute longer ride for the new course. (Stay tuned… I plan on running a comparison of several courses in a future blog). There are certainly other uses… these were just some of the original scenarios I ran with the software. One of the first things I did was run the model against a few races I’ve done (and others have done) to compare the output. What I found was that the times were “ideal”… meaning faster than what I (or others) actually rode on the course. Not a huge amount, mostly I’ve seen variances of around 1% to 3% for IM length races. When you consider the complexity of trying to model reality… chaining weather patterns, actual bicycle characteristics, when you are riding aero versus on the hoods, etc… this is very close overall. In looking at the data, the primary reason for the difference is BBS creates targets based on lower Variability Index (VI) values, meaning Normalized Power (NP) is very close to Average Power (AP). Personally, my strategy will simply be to lower my NP target slightly when running the model, assuming that with passing surges in the race my VI may run a little higher than the model projects. A manual calculation of Training Stress Score (TSS) can then be done to make sure you are within acceptable targets (see this article on TSS targeting for IM races). I have no affiliation with BBS, received no compensation for this review, and I purchased this software subscription personally. I was made aware of this product by my coach, who realizes and accepts that I’m a geek and is always looking for ways to enhance the performance of her clients.